Provincial-level administrative divisions (Chinese: 省级行政区; pinyin: shěng-jí xíngzhèngqū), or first-level administrative divisions (一级行政区; yī-jí xíngzhèngqū), are the highest-level Chinese administrative divisions. There are 34 such divisions, classified as 23 provinces (Chinese: 省; pinyin: shěng), four municipalities, five autonomous regions, and two Special Administrative Regions. All but Taiwan Province and a small fraction of Fujian Province (currently administered by the Republic of China) are controlled by the People's Republic of China. Note that every province (except Hong Kong and Macau, the two special administrative regions) has a Communist Party of China provincial committee (Chinese: 省委; pinyin: shěngwěi), headed by a secretary (Chinese: 书记; pinyin: shūjì). The committee secretary is effectively in charge of the province, rather than the nominal governor of the provincial government. The government of each standard province (Chinese: 省; pinyin: shěng) is nominally led by a provincial committee, headed by a secretary. The committee secretary is first-in-charge of the province; second-in-command is the governor of the provincial government. The People's Republic of China (PRC) claims the island of Taiwan and its surrounding islets, including Penghu, as "Taiwan Province", though Taiwan has not been under control of a government that ruled from mainland China since 1949, when the Republic of China lost the mainland to the Communist Party of China, which established the PRC. (Kinmen and the Matsu Islands are claimed by the PRC as part of its Fujian Province. Pratas and Itu Aba are claimed by the PRC as part of Guangdong and Hainan provinces respectively.) The territory is controlled by the Republic of China (ROC, commonly called "Taiwan"). A municipality (simplified Chinese: 直辖市; traditional Chinese: 直轄市; pinyin: zhíxiáshì; literally: 'direct-administrated city') or municipality directly under the administration of the central government is a higher level of city which is directly under the Chinese government, with status equal to that of the provinces. In practice, their political status is higher than that of common provinces. An autonomous region (simplified Chinese: 自治区; traditional Chinese: 自治區; pinyin: zìzhìqū) is a minority subject which has a higher population of a particular minority ethnic group along with its own local government, but an autonomous region theoretically has more legislative rights than in actual practice. The governor of each autonomous region is usually appointed from the respective minority ethnic group. A special administrative region (SAR) (simplified Chinese: 特别行政区; traditional Chinese: 特別行政區; pinyin: tèbié xíngzhèngqū) is a highly autonomous and self-governing sub national subject of the People's Republic of China that is directly under the Central People's Government. Each SAR has a chief executive as head of the region and head of government. The region's government is not fully independent, as foreign policy and military defence are the responsibility of the central government, according to the basic laws. ^ Most of the Fujian Province is administered by the People's Republic of China (PRC) while the Republic of China (ROC) retains control of the Kinmen and Matsu archipelagos under its own streamlined Fujian Province. By the time unity was finally reestablished by the Sui dynasty, the provinces had been divided and redivided so many times by different governments that they were almost the same size as commanderies, rendering the two-tier system superfluous. As such, the Sui merged the two together. In English, this merged level is translated as "prefectures". In Chinese, the name changed between zhou and jun several times before being finally settled on zhou. Based on the apocryphal Nine Province system, the Sui restored nine zhou. Emperor Taizong (r. 626–649) set up 10 "circuits" (道, dào) in 627 as inspection areas for imperial commissioners monitoring the operation of prefectures, rather than a new primary level of administration. In 639, there were 10 circuits, 43 commanderies (都督府, dūdū fǔ), and 358 prefectures (州 and later 府, fǔ). In 733, Emperor Xuanzong expanded the number of circuits to 15 by establishing separate circuits for the areas around Chang'an and Luoyang, and by splitting the large Shannan and Jiangnan circuits into 2 and 3 new circuits respectively. He also established a system of permanent inspecting commissioners, though without executive powers. * Circuits established under Xuanzong, as opposed to Taizong's original ten circuits. 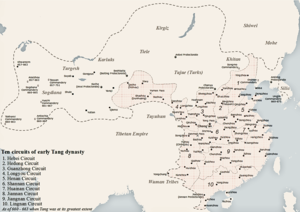 ** Circuits established under Xuanzong by dividing Taizong's Jiangnan and Shannan circuits. Other Tang-era circuits include the West Lingnan, Wu'an, and Qinhua circuits. The Song government abolished the previous commissioners and renamed their circuits 路 (lù, literally meaning "roads", but however is still usually translated into English as "circuits"). They also added a number of "army" prefectures (軍/军, jūn). 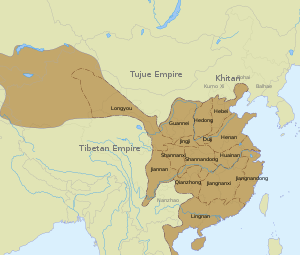 China was reoragnised into 11 provinces keeping most of the previous boundaries of provinces created by the previous dynasty unchanged, the Yuan Dynasty (1271–1368) had 2 addition regions: Central region ruled by the Zhongshu Sheng (中書省) and the Tibetan region ruled by the Bureau of Buddhist and Tibetan Affairs (宣政院). Gansu 甘肅 (甘肃) Gānsù Ganzhou Circuit 甘州路 Gānzhōu Lù Zhangye Consist of modern location of Gansu, Ningxia, & eastern Inner Mongolia. southern Hubei & western Guangdong. Henanjiangbei 河南江北 Hénánjiāngběi Bianliang Circuit 汴梁路 Biànliáng Lù Kaifeng Consist of modern location of Henan, northern Hubei, northern Jiangsu, & northern Anhui. Jiangxi 江西 Jiāngxī Longxing Circuit 龍興路 (龙兴路) Lóngxìng Lù Nanchang Consist of modern location of Jiangxi & eastern Guangdong. Jiangzhe 江浙 Jiāngzhè Hangzhou Circuit 杭州路 Hángzhōu Lù Hangzhou Consist of modern location of Shanghai, Zhejiang, Fujian, southern Jiangsu, & southern Anhui. northwestern Inner Mongolia, northern Korea, & Outer Manchuria. Lingbei 嶺北 (岭北) Lǐngběi Hening Circuit 和寧路 (和宁路) Héníng Lù Kharkhorin Consist of modern location of Mongolia & southern Siberia. Yunnan 雲南 (云南) Yúnnán Zhongqing Circuit 中慶路 (中庆路) Zhōngqìng Lù Kunming Consist of modern location of Yunnan and Upper Myanmar. Zhengdong 征東 (征东) Zhēngdōng Kaicheng Circuit 開城路 (开城路) Kāichéng Lù Kaesong Consist of modern location of southern Korea. northern Henan, central Inner Mongolia, & western Hebei. A direct rule region under Zhongshu Sheng (Central Secretariat). Tibetan region* 宣政院 Xuānzhèng Yuàn none Consist of modern location of Tibet, Qinghai, & western Sichuan. the territory of Tibet under the Bureau of Buddhist and Tibetan Affairs. 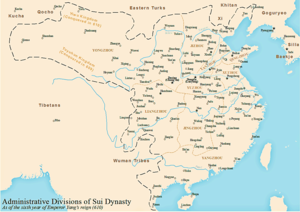 The Ming Dynasty (1368–1644) kept the province system set up by the Yuan Dynasty, however, it divided the original 10 provinces into 16 provinces, later 2 capital metropolitan areas and 13 provinces (兩京十三省) within China proper and 5 additional military ruled regions. Huguang 湖廣 (湖广) Húguǎng Wuchang Prefecture 武昌府 Wǔchāng Fǔ Consist of modern location of Hunan & Hubei. Provincial seat modern location is Wuhan. Shaanxi 陝西 (陕西) Shǎnxī Xi'an Prefecture 西安府 Xī'ān Fǔ Consist of modern location of Shaanxi, Gansu, & Ningxia. Sichuan 四川 Sìchuān Chengdu Prefecture 成都府 Chéngdū Fǔ Consist of modern location of Chongqing & eastern Sichuan. Yunnan 雲南 (云南) Yúnnán Yunnan Prefecture 雲南府 (云南府) Yúnnán Fǔ Provincial seat modern location is Kunming. Jiaozhi 交趾 Jiāozhǐ Jiaozhou Prefecture 交州府 Jiāozhōu Fǔ Consist of modern location of northern Vietnam. North Zhili 北直隸 (北直隶) Běizhílì Shuntian Prefecture 順天府 (顺天府) Shùntiān Fǔ Consist of modern location of Beijing, Tianjin, & Hebei. Provincial seat modern location is Beijing. South Zhili 南直隸 (南直隶) Nánzhílì Yingtian Prefecture 應天府 (应天府) Yìngtiān Fǔ Consist of modern location of Shanghai, Jiangsu, & Anhui. Provincial seat modern location is Nanjing. Nurgan* 奴兒干 (奴儿干) Nú'ergàn none Consist of modern location of Heilongjiang, Jilin, central-eastern Inner Mongolia, & Outer Manchuria. Liaodong* 遼東 (辽东) Liáodōng none Consist of modern location of Liaoning. Ü-Tsang* 烏斯藏 (乌斯藏) Wūsīzàng none Consist of modern location of Tibet. Dokham* 朵甘 Duǒgān none Consist of modern location of Qinghai & western Sichuan. Elis* 俄力思 Élìsī none Consist of modern location of Ngari, Tibet. By the time of the establishment of the Qing Dynasty (1644–1912) in 1644 there were 18 provinces, all of them in China proper (內地十八省). Each province had a xunfu (巡撫; xúnfǔ; translated as "governor"), a political overseer on behalf of the emperor, and a tidu (提督; tídū; translated as "captain general"), a military governor. In addition, there was a zongdu (總督; zǒngdū), a general military inspector or governor general, for every two to three provinces. Outer regions of China (those beyond China proper) were not divided into provinces. Military leaders or generals (將軍; jiāngjūn) oversaw Manchuria (consisting of Fengtian (now Liaoning), Jilin, Heilongjiang), Xinjiang, and Mongolia, while vice-dutong (副都統; fù dūtǒng) and civilian leaders headed the leagues (盟長; méng zhǎng), a subdivision of Mongolia. The ambans (駐藏大臣; zhù cáng dàchén) supervised the administration of Tibet. In 1884 Xinjiang became a province; in 1907 Fengtian, Jilin, and Heilongjiang were made provinces as well. Taiwan became a province in 1885, but China ceded Taiwan to Japan in 1895. As a result, there were 22 provinces in China (Outer China and China proper) near the end of the Qing Dynasty. The Republic of China, established in 1912, set up four more provinces in Inner Mongolia and two provinces in historic Tibet, bringing the total to 28. In 1931, Ma Zhongying established Hexi in the northern parts of Gansu but the ROC never acknowledged the province. However, China lost four provinces with the establishment of the Japanese puppet state of Manchukuo in Manchuria. After the defeat of Japan in World War II in 1945, China re-incorporated Manchuria as 10 provinces, and assumed control of Taiwan as a province. As a result, the Republic of China in 1946 had 35 provinces. Although the Republic of China now only controls one province (Taiwan), and some islands of a second province (Fujian), it continues to formally claim all 35 provinces (including those that no longer form part of the area of the People's Republic of China). The People's Republic of China abolished many of the provinces in the 1950s and converted a number of them into autonomous regions. Hainan became a separate province in 1988, bringing the total number of provinces under PRC control to 22. During the 20th century, China claimed that numerous neighbouring countries and regions in Asia were "lost territories" of China. Many of these "lost territories" were under the rule of Imperial Chinese dynasties or were tributary states. Sun Yat-sen claimed that these territories were lost due to unequal treaties, forceful occupation and annexation, and foreign interference. Chiang Kai-shek and Mao Zedong, among others, were supportive of these claims. China published a series of maps during this time known as a "Map of National Shame" (Chinese: 國恥地圖; pinyin: Guóchǐ dìtú) which showcased some of the "lost territories" that had links to various Imperial Chinese dynasties. The provinces in south coastal area of China—such as Zhejiang, Jiangsu, Fujian and (mainly) Guangdong—tend to be more industrialized, with regions in the hinterland less developed. ^ Hwang, Jim (October 1999). "Gone with the Times". Taiwan Review. Archived from the original on 2012-02-26. Retrieved 2012-01-11. ^ "Macao in Figures". Government of the Macao Special Administrative Region Statistics and Census Service. 2016. Archived from the original on 2018-11-05. Retrieved 2018-08-15. ^ "GB/T 2260 codes for the provinces of China". Archived from the original on 2004-03-05. Retrieved 2011-10-30. ^ "Doing Business in China – Survey". Ministry Of Commerce – People's Republic Of China. Archived from the original on 2013-08-05. Retrieved 5 August 2013. ^ Twitchett 1979, pp. 203, 205. ^ Twitchett 1979, p. 404. ^ a b c d e f g h i j Tseng, Hui-Yi (2017). Revolution, State Succession, International Treaties and the Diaoyu/Diaoyutai Islands. Cambridge Scholars Publishing. p. 66. ISBN 9781443893688. ^ a b c d e f g h i j k l m Kim, Samuel S. (1979). China, the United Nations, and World Order. Princeton University Press. p. 43. ISBN 9780691100760. ^ Tzou, Byron N. (1990). China and International Law: The Boundary Disputes. Praeger. p. 77. ISBN 9780275934620. 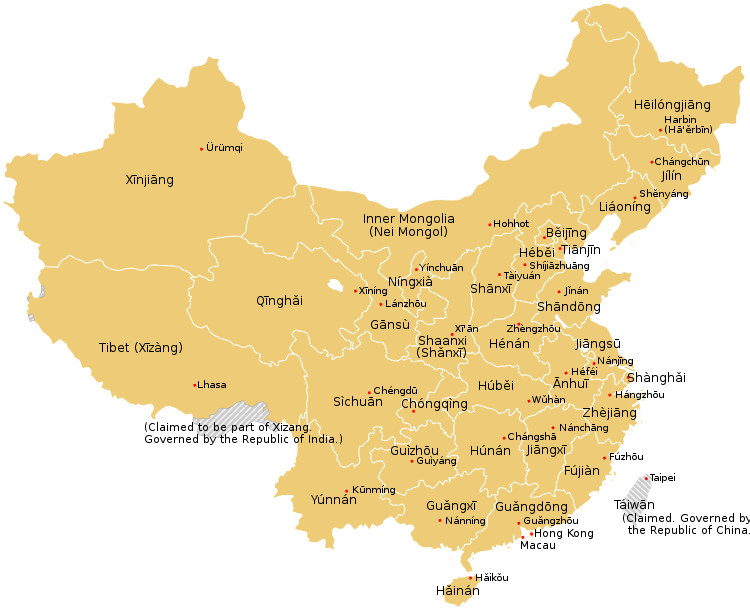 Wikimedia Commons has media related to Provinces of China. Wikivoyage has a travel guide for List of Chinese provinces and regions. Interactive Dbresearch.com: WebMap — with economic indicators for all Chinese Provinces.